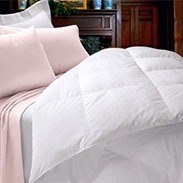 Made with down-proof 330 thread count damask cotton fabric and hypoallergenic 600 fill power white goose down. Made in the USA. Average price is above $300. Available in 4 warmth levels from "year-round" to extra heavy warmth. Also available as a blanket and light weight summer comforter. I haven't tried this comforter yet. Do you want me to review this product? Let me know here. Go back to the comforter finder to compare other brands. Rate the comforter with number of stars (5 is the best). Answer the questions to the best of your ability. That way others will know if this is the right comforter to buy. Leave any other comments that you feel would be helpful.